He spurned his duty to act on OPCC corruption. With characters like Gordon Hogg in office, political hypocrisy couldn’t be more obvious. The BC Liberal MLA talks about his “fiduciary duty” to examine (and no doubt distance himself from) his party’s ethnogate scandal. But he and six other MLAs abandoned their fiduciary duty by rejecting public input into their audit/inquiry into B.C.’s Office of the Police Complaint Commission. But when it came to serving the cop status quo, Hogg went beyond the call of duty. He set up a conference call with a group of unnamed police officers. Nothing in the committee’s mandate required him to do that. Yet he used an absurd excuse to reject any input from outside the police lobby. Now he talks about his fiduciary duty in another matter. Hypocrite Hogg just wants to keep his snout in the trough. Along with his six fellow committee members, Hogg is now complicit in OPCC corruption. 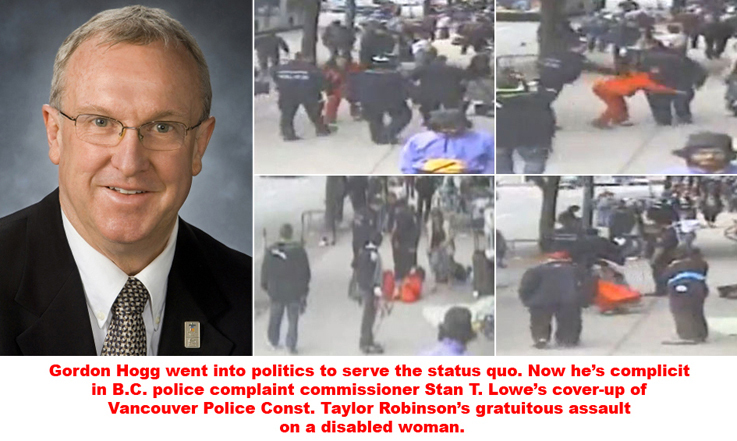 That includes the joint OPCC/VPD cover-up of Vancouver Police Const. Taylor Robinson’s gratuitous assault on a disabled woman.